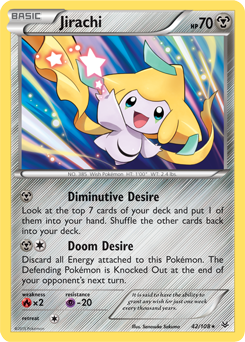 Does Jirachi's Doom Desire attack only work if this card stays in play or does it still work even if it is knocked out? Can I see the card? I'd say it would still do damage but I'm not sure. I looked at Reddit, it had nothing on if Jirachi dies but the attack is still easily avoided by switching or evolving the pokemon affected by Doom Desire, if that helps at all. Thank you for your help Proffessor Epic, it has been a great help. Took me a while to find the answer, but I know now! Okay if Jirachi uses Doom Desire and get knocked out, Doom Desire is no longer in place. And as was said in the comments, the effect also goes away if the defending Pokemon retreats. Why is Doom Desire a usually useless move on Pokémon Showdown? Jirachi won't learn Doom Desire? EOT/EOD - Regarding Jirachi's Recruitment? Why is Jirachi in the ORAS Hoenn pokedex if you can`t even find it in ORAS?